A rescue home dog has qualified to be a police sniffer dog, after her potential was spotted hundreds of miles away. English springer spaniel Ruby is now part of the Bedfordshire, Cambridgeshire and Hertfordshire Dog Unit, after dog handler, PC Mark West read about her on the internet. He made about a 336 mile (540km) round trip from Luton to Manchester, where she was being housed, to see her. He said he knew "there was something about her" straight away. 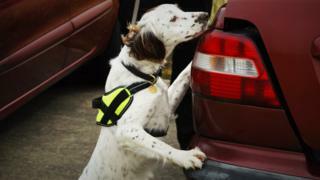 After a month of training, the year-old spaniel, has now started work as a drugs, cash and weapons search dog. PC West said: "I saw her on the Dogs Trust website and there was just something about her. "Even in the photograph she looked incredibly alert, so I immediately called the team and when they spoke to me about her I was pretty confident that she was just what I, and the department, was looking for." When he met her he described her as having real focus, as Ruby immediately chased her beloved tennis ball and patiently searched for it wherever he hid it, he said. After her graduation, PC West said: "She passed with flying colours. I'm very proud. "She gets on brilliantly with my other dog Dexter and she completes our team. "Dexter is a firearms support dog so he is alongside officers at firearms warrants. Once we have entered a property Ruby will then go in to do the searching side of things. She is brilliant." Carol Margieson, deputy manager at the Dogs Trust in Manchester, said she was "delighted" that Ruby had been put to work as "we have had our fingers crossed waiting to hear if she passed".